Pass the Wavy Gravy, please. After I’d imagined myself as the next international rock star, only to have those hopes smacked down by reality, I moved on. If only I’d moved in a slightly different direction, I might have ended up behind a microphone doing something other than speaking to yawning audiences of professional colleagues, expounding on topics of grave interest to my fellow librarians. “You know, VisiCalc* will soon become the tool we use to manage entire library budgets and expenditures.” I’d prophesize from the podium. Another gem was, “BITNET** is going to revolutionize the way we exchange information.” Who knew I was such a prodigious prognosticator? What I would rather have been doing during those speeches was spinning some records and talking about the bands whose songs I was playing. So, it’s no surprise that sometime between the introduction of VisiCalc and the unleashing of the Internet, I’d submit my name to a local radio station contest in hopes of being selected to guest DJ a three-hour “classic rock” program. Contestants were asked to submit a short list of songs they proposed to play. To my surprise and delight, I was selected. The person who called, suggested bringing enough music on vinyl or CD to fill three hours. Counting commercial breaks, station IDs, local news and weather reports, it amounted to what seemed like only twenty minutes, though I’m sure it was quite a lot more. On a crisp Saturday morning in October 1989, I was the guest DJ on that classic rock radio station in La Crosse, Wisconsin. I brought along a crate load of LPs and CDs containing twenty-year old music to play and chat about on air with the show’s host. About an hour into the program and much to my surprise, Wavy Gravy walked into the studio. Wavy, whose real name is Hugh Romney, was the iconic “Hog Farm” operator at the Woodstock Music & Arts Festival in 1969. A perpetual peace activist and counterculture clown, he had performed a stand-up show the previous night at the city’s fine arts venue, the Pump House. 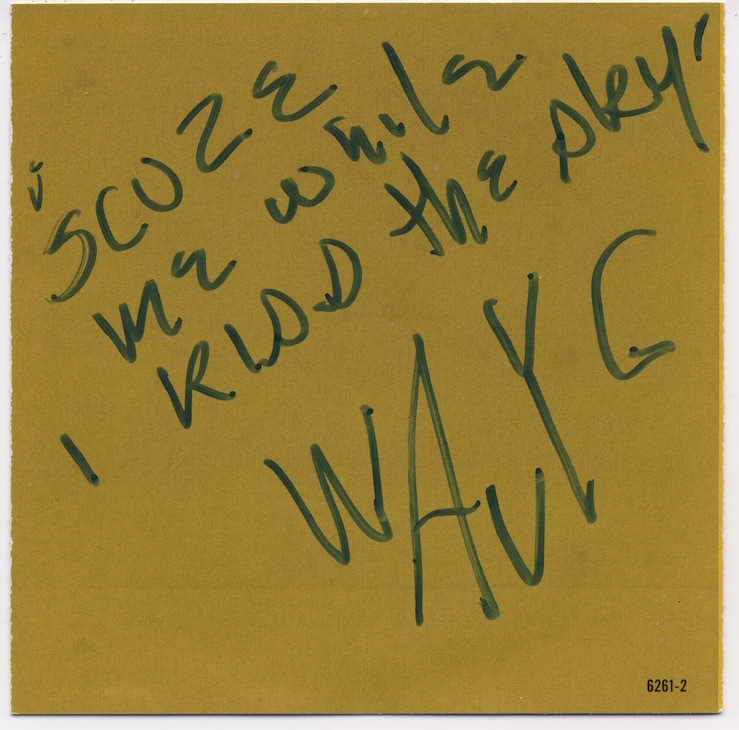 It says, “‘Scuze me while I kiss the sky” and is signed “Wavy G.” After he left the studio and we queued up another song, my host asked if I’d been to Wavy’s show the night before. Embarrassingly, I had to respond that I hadn’t. He smiled and then explained why Wavy chose those words from the song Purple Haze. During one part of his act, when he was describing Jimi Hendrix’s early morning performance at Woodstock, he stepped in front of a loudspeaker, accidentally causing a couple seconds of screeching feedback. He paused, looked up toward the rafters and uttered, “‘Scuze me while I kiss the sky,” resulting in wild cheers and applause from the audience. Now, whenever I hear a Jimi Hendrix song, I think of meeting Wavy Gravy and wonder how in the world I was lucky enough to capture a personal moment with him. I chalk it up to experience. Mainly the one I missed. “But first, are you experienced? Have you ever been experienced? Well, I have.” –Jimi Hendrix, Are You Experienced?